This chapter introduces the reader to the problem of high-quality large-scale underwater optical mapping, as well as to the need for blending techniques to improve the quality of the generated maps. Underwater surveys are nowadays carried out by Underwater Vehicles (UVs), which allow diving at extreme depths during long periods of time. Optical imaging provides short-range high-resolution visual information of the ocean floor. Unfortunately, several medium-specific phenomena, such as light attenuation and scattering, constrain the acquisition by limiting the maximum area covered by a single image. 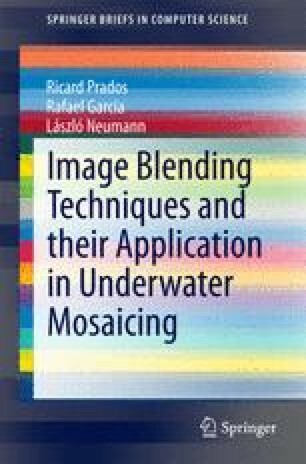 Hence, optically mapping large seafloor areas can only be achieved by building image mosaics from a set of reduced area pictures, i.e. photo-mosaics. Blending techniques provide a set of heterogeneously appearing images of a given map with a continuous and consistent appearance. Beyond visual appearance, blending techniques are also important for proper interpretation and scientific exploitation of seafloor imagery. Finally, the book structure is outlined at the end of the chapter.